Ready to smell? 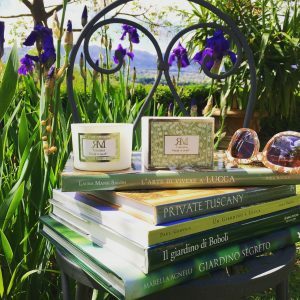 is a gallery of scented perfumes and candles dedicated to cosmopolitan, discerning and stylish travelers. Created by Mariangela Rossi, lifestyle and travel writer for Elle Italy, How to Spend It and other renowned magazines, as well as Scent Tours organizer and book author on olfactory culture, the collection is inspired by her life – a journey marked by perfume. “I have been conducting extensive research and writing stories about scent creations for 15 years, and this new expression is exciting and feels very natural to me. I’ve always been obsessed with fragrances and fascinated by how flowers, nature and experimental formulas blend with the visual and the olfactory”, says Mariangela. Driven by her passion and tenacity, she turned her olfactory obsession into a narrative outlet beyond just the written word, launching her own line of one-of-a-kind candles and home perfumes under the Ready to Smell? label. Reminiscent of the 18th century Grand Tour, the collection combines history, art, elegance and luxury craftsmanship. A tribute to Italian excellence, for people who truly appreciate beauty. All items are available upon request with a customized fragrance and design, making the perfect gift for a special occasion or opportunity to create your own signature scent. Handmade from the finest ingredients and wax blends, each candle is scented with exquisite IFRA certified fragrances produced by talented perfumers, while the founder herself personally handles concept and creative direction. Each Ready to Smell? 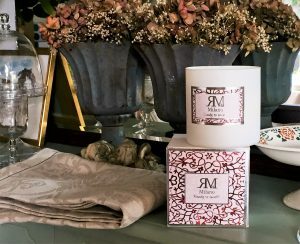 candle is made with the utmost care and attention to detail: a white frosted glass holder, which can be reused as a decorative container for bulbs, pens or make-up brushes; an elegant white paper box; organic cotton wicks; hot-pressed silver labels with patterns evoking frescoes, motifs and tapestries from sumptuous Italian palaces. A completely unique way to savor the perfume of art and history. The Ready to Smell? candle collection is available in three fragrances, Milano, Portofino and Toscana, places dear to Mariangela’s heart, and in four sizes: 140 gr, perfect for the sophisticated globetrotter’s shopping list; 320 gr, ideal as an interior design piece; 700 gr, an eye-catching centerpiece in expansive spaces and hotel lobbies, and in the Candle Discovery Set, with three home candles of 70gr. The perfume of an environment, as well as a personal perfume, both express something unique. Emotions, memories, thoughts. 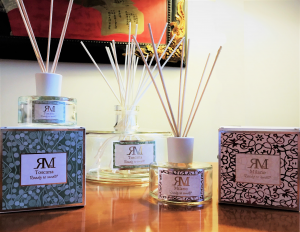 The glass diffusers with reed diffuser in natural rattan created by “Ready to smell”, avalaible in bottles 100 ml, 250ml and 3 lt, represent excellence, attention to details and a deep research of raw materials. Also perfect as accessories for the house. A real ode to Summer. A poetic walk in one the world’s most idyllic villages. Scents of jasmine, fresh lemon and notes of saltwater. 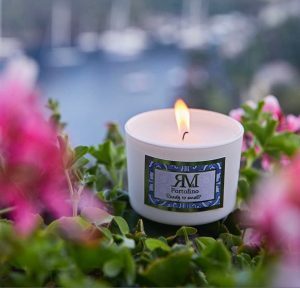 This candle transports you to Portofino amidst the gentle rocking of fishing boats, where a fresh breeze carries a myriad of fragrances: bushes, flowers, woods and sea. The white and blue label recalls painted boat hulls, the local handcrafted ceramics and the blue palette in the former British Consul’s Castle overlooking the picturesque port. A little ray of instant sunshine. A mix of glimpses, people, emotions. A stage of endless opportunities. 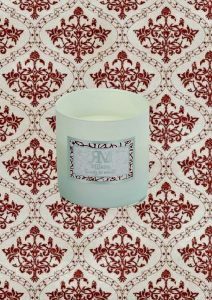 This candle is a tribute to the excellence of Made-in-Italy, and unveils an accord of woods and leather, alluding to Milan’s role as fashion and design capital. Underneath, subtle notes of saffron recall the city’s signature risotto dish and mingle with unexpected floral scents evoking the hidden courtyards, cloisters and Leonardo da Vinci’s secret vineyard in the heart of Milan. 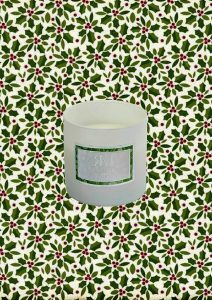 The artist’s frescos inspired the candle’s decorative label. A region of ancient perfumes and modern charm. The comfort of a crackling wood fire. 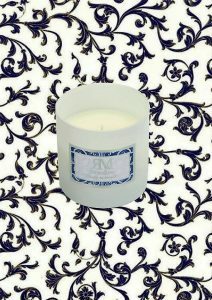 This candle is imbued with soft essences of iris and cyprus, putting you in a warm and indulging mood. It tells the story of a cozy holiday night spent sipping a glass of grand cru red wine, while invoking visions of the noble palaces near Florence’s Ponte Vecchio, with their decorative tapestries and painted beams, and the scent of incense emanating from nearby churches.